Wow!! The billboard signals of extreme crisis are overwhelming. Three years of near 0% with no recovery. A full year of ample USTreasury and mortgage bond monetization with no recovery. Tons of cash aid deliveries to the big US banks with no recovery. Some key corporate nationalizations with no recovery. Oodles of errant stimulus programs with no recovery. Some important misdirection in home loan aid initiatives with no recovery. The US Federal Reserve admits it can do nothing more as a recovery remains elusive. The USGovt is paralyzed by disguised fascist warmongers opposed by disguised marxist collectivists, but intent on maintaining the status quo among bank fraud. An approved accounting fraud directive is kept in place to present a picture of bank solvency. Intermediate credit markets have come to a standstill. The US stock market is in tatters. The USTreasury Bond market is the only conventional rally at work. And with all these programs, developments, and events, the USEconomy moves toward a recession with relentless determination and purpose, In today's age of lying about price inflation by at least 5%, that means the recession is about to turn into a Minus 5% Recession after never exiting the recession recognized in 2009. The billboard messages are dire, ugly, dreadful, dangerous, and full of destruction, typical of systemic failure. Too bad the Keynesian textbooks do not have a chapter on banking system insolvency, or one quarter of the households living in negative equity, or central bank toxic paper pits, or global currency war, or confiscation of tyrant accounts. The ineffective monetary & fiscal policy has ushered in the nightmarish systemic failure. That is what is occurring. Big US banks remain insolvent. The claim is greater financial health versus 2008, but only because they grade their own balance sheet assets and shove much toxic paper to the USFed. As credit engines, they sputter. As USTBond carry trade mechanics, they hum along. Their REO home inventory is strangling them. DEBT DOWNGRADES TO BANK OF AMERICA, WELLS FARGO, AND CITIGROUP HAVE COME FINALLY. Central bankers finally see the futility of attempting to recapitalize the giant insolvent hollow trees called the big banks. The banks are losing capital faster than they can take in new capital, either from gifts by central banks (toxic bond redemption) or secondary stock issuance (long gone opportunity). BIG BANK RECAPITALIZATION RECOGNIZED AS FUTILE. The US housing market is stuck in quicksand. Low mortgage rates mean nothing to home loan applicants who must pass very strict FICA tests. They mean nothing to home loan applicants who must refinance their loans or default, suffering under the weight of negative home equity. RESUMED HOME PRICE DECLINE IN THE LAST FEW MONTHS DESPITE FALLING MORTGAGE RATES. The USFed enjoys falling long-term rates since their credit assets rise in value. That makes the central bank look less broken. They cannot send back the so-called Excess Reserves to the big banks (actually Loan Loss Reserves) since the central bank would look more wrecked. USFED BALANCE SHEET WORTH OVER MINUS $1.3 TRILLION. The Shadow Banking system requires $1 trillion per year in replenishment, as the bone marrow rapidly vanishes within the US banks. Mortgage bonds and asset backed financial products lead the way in colossal erosion on their balance sheets. QE3 PROGRAM NEEDED JUST TO AID THE FALLING CAPITAL IN THE GREAT DE-LEVERAGE PROCESS. USGovt budget process has turned into tragic comedy in a powerful stalemate. The emphasis has been on spending austerity and management of the debt limit. The reality is that the limit has been reached again, probably breached. The reality is that renewed spending for urgent economic stimulus will overwhelm any budget prudence. A WORSE $2 TRILLION USGOVT DEFICIT SET FOR NEXT YEAR. The US leaders have squandered time, money, and political capital. They have missed the opportunity for reform and remedy. Devotion to bank redemptions and avoidance of liquidation have wasted money. Vacant vapid stimulus programs have wasted time. The nation has run out of time. Breakdown and panic have begun in earnest. The political arena has a closed door toward well conceived actions. THE POLTICAL ARENA AS GIGANTIC OBSTRUCTION TO THE USECONOMY, WITH MASSIVE DEFICITS ACTING LIKE CLOTS. The central bank franchise system is being recognized for its failure, ineptitude, helplessness. The system is saturated with debt. The solution to treat the excess of debt is to add to the debt levels and to let loose the dogs of monetary hyper-inflation. CENTRAL BANKS SEEN AS PART OF THE PROBLEM, MAKING CONDITIONS WORSE. A bank run has begun in Europe, with epicenter in France. The land of France belongs among the PIGS nations, since the big French banks are the primary broken shepherd creditors for the PIGS. They hold more than all the other nations combined almost in Greek debt. They own huge levels Italian debt. Siemens and Lloyds have abandoned France, yanking money out. A BANK RUN IN FRANCE GATHERS SPEED TO MAKE A CRATER IN EUROPEAN BANKING SYSTEM. China had been gobbling up PIGS sovereign debt bought at discount. They took a truckload from Greece and Portugal, in return for consideration on key conversions of assets or gold bullion. They are in talks with Italy. But they have a different treatment for France, pulling out of the currency market forward and swap contracts in trading lines for the benefit of French banks. China is angry about the European Union decisions against a market economy. CHINA HAS BECOME A PLAYER IN EUROPEAN BANKING TO BE RECKONED WITH. The Competing Currency War spreads like wildfire, still not properly recognized, seen as isolated actions by central banks. Nations like Brazil and Switzerland suffer from a rising currency, as their export trade is damaged on higher prices. Rate hikes backfire. Nations whose currencies are falling have seen an associated steep decline in business investment and seizures in the interbank lending. Rate cuts do not address insolvency. ALL NATIONS LOSE IN THE CURRENCY WAR. Central bankers met in Poland to address the worsening chronic global financial crisis. They agreed on nothing except they despise US Treasury Secy Geithner. The European bankers believe the Financial Stability Fund for bailouts is adequate, a very wrong view. THE EURO BANKERS FEEL HELPLESS LIKE THEIR AMERICAN COUNTERPARTS. Grandiose aid to PIIGS nations failed to halt their momentum into the pits. A ripe $360 billion in collective aid failed to put these broken nations on a proper footing off cloven hoofs. The aid was actually bank aid to the Central European and London bankers. The key is the Poison Pills forced down the PIIGS throats in the pigpen. Now comes a string of sovereign debt downgrades, extending to Italy. NO REMEDY TO THE PIIGS NATIONS SINCE THE ENTIRE AID PROCESS IS MISDIRECTED. The USFed does not comprehend the principles of capitalism. They believe that the USEconomy is driven by disposable cash in consumer hands, and by stock market investment trickle down. Economists and banking officials are ignoramuses one and all. The reliance upon Panhandle Doctrine for consumers and Parasite Doctrine for banks has killed the nation. THE UNITED STATES LOST ALL CONCEPT OF CAPITAL FORMATION. The deep acceptance and tolerance of constant war and preoccupation with security has led to $2.5 trillion in squandered war costs and $600 billion in squandered security agency costs. The United States embrace of Fascism has killed the nation. HALF THE USGOVT DEBT FROM WAR, HALF THE USGOVT DEBT FOREIGN OWNED, AN ENTERPRISE DIRECTED AT DESTRUCTION. The USDollar is losing its secure status of global reserve. The Chinese Yuan is expanding in bilateral trade accords and supporting currency swap facilities. The London bankers aid China in creating viable off-shore Yuan trading centers. Times are really bad when even Nigeria diversifies away from US$-based assets. THE CHINESE YUAN TO BE CONVERTIBLE IN A COUPLE YEARS AHEAD OF SCHEDULE, A GREAT CHALLENGE TO THE USDOLLAR. Raids on foreign national accounts continue unabated. The funds in Egypt were taken ($60 billion) as London offered sanctuary, while Mubarek faces a bizarre court procedure for murder and theft. The funds in Libya were frozen ($90 billion) as the US, London, and Europe did confiscations through freeze, but give assurance that it will be returned when the stated 348 requirements are met, as in never. US & ANGLO BANKS SO DESPERATE FOR CASH THAT THEY TAKE IT FROM DESPOTS, AS NATIONS ARE DISRUPTED AND THE FIRE OF WAR IS LIT. The entire system from numerous different corners attempts to translate the list of ailments into simple terms of confidence and volatility. The actual watchwords are insolvency and deterioration, with momentum gathering toward systemic collapse. The implication is that the monetary system is breaking down. THE CRITICAL CATCH PHRASE IS CONFIDENCE, THE MAIN REQUIREMENT TO A FIAT PAPER BASED MONETARY SYSTEM. The interconnection of financial firms extends within continents and across the vast oceans to render them tied to the same global fate. If one big bank fails, or one nation fails, then the contagion will be rapid. GREECE PUSHED THE WESTERN BANKS TO THE EDGE, BUT ITALY AND FRANCE PUSH THEM OVER THE EDGE. Attention has gathered on the corrupted accounting of the popular but tainted exchange traded Gold & Silver funds. The gold inventory is under scrutiny for usage in COMEX deliveries, enabled by questionable shorts to the GLD and SLV shares by its own custodians. The Bar Lists are regularly seen as erroneous and suspicious. THE BIGGEST GOLD & SILVER FUNDS ON THE DEFENSIVE, SOON TO FACE EITHER MASS EXITS OR HEAVY DISCOUNTS TO THE PRECIOUS METAL SPOT PRICES. The central banks of Shanghai Coop Org (SCO) member states, observer states, and dialogue partners are almost all purchasing gold, overtly or covertly. Or else they are demanding the return of their gold bullion from the US & London centers. The latest demand was from Chavez of Venezuela. Russia is accumulating gold, shutting off its export. China is accumulating gold, making citizen ownership easier. SCO LEADERS IN RUSSIA & CHINA ORCHESTRATE A POLICY TO ACCUMULATE GOLD AND PRESSURE THE WEST. The rally to ruin is in the USTreasury Bond market. Despite the downgrade slapped on the USGovt debt by Standard & Poors, the long-term bond yield has fallen well below the benchmark 2.0% level. It is under 1.8% today. The official government bond market is crowding out the business credit market. The end of the road is around 1.5%, at which point little if any profit potential will be perceived. The role of Interest Rate Swaps is critical, but not well understood to start a phony process that the public joins. The machete slices doled out to the saving community in puny interest yield is harsh and cruel. Gold will be seen as taking in diverted profits from USTreasury Bond proceeds. END OF USTREASURY CARRY TRADE IS NEAR, AS BIG BANKS TO BE FORCED TO FIND ANOTHER EASY MONEY RIGGED TABLE. The uptrend in the Gold chart is intact. A massive breakout is in a period of consolidation since August. Expect more USFed monetization purchase of USTreasury Bonds, a process that has not stopped. The main emphasis of the USFed and QE discussion is simple. They continue the debt monetization but have decided not to talk about it anymore, in an end to transparency. Expect more USGovt stimulus, as austerity is shoved aside. Expect $2 trillion in USGovt deficits next year, as revenues are on the decline and urgent new stimulus programs will be eventually passed. Gold rises from the ruin of the monetary system and elimination of all safe havens. People should not be discouraged by the relatively minor selloffs in Gold & Silver. The gold price is still at or above the uptrend line even after the minor panic on Thursday. Even at $1740, a hefty 12% gain in gold asset appreciation has been seen since the June $1550 price, for only one quarter in time. What a rout! What a distortion! What a joke! Climb aboard! When the storms pass and need for bank recapitalization occurs, the need for economic stimulus occurs, the need for more sovereign bond redemption occurs, the need for more debt monetization (new & rollover) occurs, the Gold price will fly past the $2000 mark. Memories are indeed very poor and fleeting. The market slammed the Gold price in early May back down to $1500 during ambushes, yet in only four months new highs over $1900 were registered. History will repeat itself, but without the weak hands on the wagon train. They never learn, and neither do the nitwit Deflation Knuckleheads. They are consistently half blind. They were overrun by the gold train this summer, but maintain their arrogant erroneous views. Prepare for a massive Gold rally when the recapitalization, stimulus, redemption, and monetization comes forth in a very public manner. 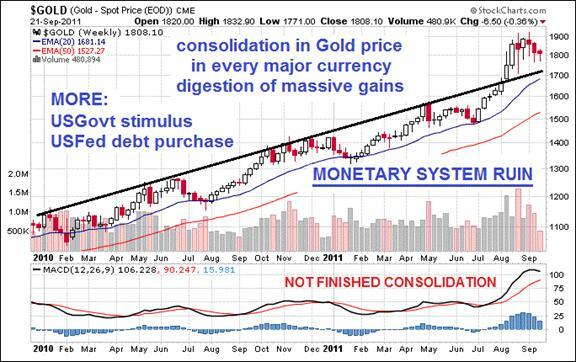 During the collapse underway, Gold & Silver will be among the very few assets standing. The USTreasurys eventually will be wanted by nobody except the USFed central bank. Their bid will be alone, leading to a USDollar symbolic of the failed monetary system. The USTBond will be in retreat from the 1.5% low point in yield, as foreign creditors will finally jump off the asset bubble zeppelin before it lights up in flames. 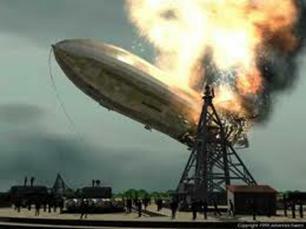 Few people know the story behind the Hindenburg. The United States denied supply of helium to Germany in a trade war, which resulted in the high risk usage of hydrogen. In parallel, foreign creditors will deny legitimate funding to the USTreasury Bond market, a process well along. The USGovt in turn has resorted to the high risk usage of direct monetary inflation, in the perverse debt monetization window. The investment community wants even more of it (hydrogen). History will repeat itself. Who could ever forget the New York Post headline after the death of Leonid Brezhnev during the Cold War? REDS BREZH DEAD! The next headlines could read: YANKS JIG UP!! "Jim Willie: Gold and Silver Short Covering Has Begun, Silver to Pass $50 Before October"
Well, we are living in *very* volatile times and it's not October yet. In any event, forecasters only need to be right MOST of the time to be successful. Anyone who claims to be right the whole time is living in fantasy land.